What better way to bring me back to writing than a royal love story? I have been MIA from the writing world for about 5 years. Life took over, but I am back now. My first returning blog post is about the Royal Wedding. I have been a royal admirer my entire life, but the newest romance has sucked me in deep and I am officially obsessed. Why you may ask, well it's simple, Prince Harry and Meghan Markle are such an inspiration. Prince Harry and Meghan Markle are both huge philanthropists in their own right. Long before ever meeting each half of this power couple had done amazing things to make this world a better place. Of course Harry is obligated to some point by duty, but no one made him create the Invictus games. He also continued with many of his late mothers charities. One of my favorite causes Harry is a part of is mental health. So many people are scared of mental health issue, they hide them, but the Royal family has been fantastic at bring a new light to the issue. Now Meghan, she started as age as a feminist, fighting for equality, something she continued into her adult years. Meghan has also been part of The Clean Water project. Something I personally would love to be apart of. Now it's likely you know as much about their love story as I do, so its mute point to recap every little thing. What I will do is point out some things that make my heart flutter, as well as pieces that I personally feel are so important to our history. Everyone knows that Meghan is a biracial American actress and that Harry is the prince of England (sixth inline to the throne). Myself being a Canadian, I feel like we have a special place in their love story. After all Meghan was living and working here in Canada when they courted. I think that is a really cool way for Canadians to feel involved. Not to forget that we are also part of the commonwealth. On May 19, 2018 I stayed up all night to watch their wedding. Of course right away there were people around the world ready to tear apart every little detail. First off I want to say to these people, it really doesn't matter what anyone else thinks, because it was their wedding and they planned it the way they wanted. They are truly the only people that matter here. We were blessed that they shared their day with us. The dress, many of us waited with baited breath to see what Meghan would wear. I loved watching Meghan and her mother drive to the wedding in complete amazement and excitement for their special day. Mother and daughter together, soft smiles, fighting back tears of joy and still waving to all the adoring onlookers. Once arriving at the church and stepping out of the car, we finally got our first view of the dress. It looked simplistic and feminine, but it wasn't until Meghan stood atop of the church stairs and her sixteen foot viel was laid out to be admired that we got the full effect. I thought it was such a beautiful sight. The simple ivory silk gown and the long veil, which has a special touch of embroidered flowers from all the 53 commonwealth countries. 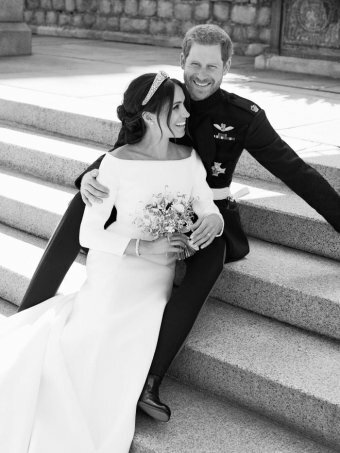 I loved the simple way the dress framed her shoulders and felt she picked the perfect dress for her royal wedding and yet kept it true to herself. She also paired it with the Queen Mary tiara, one of the simpler royal jewels. Absolutely stunning! The service, many people were surprised by parts of the wedding, such as the bishop, Meghan's mom sitting alone and more. Well here are a few little things I noticed about the wedding and what I found so amazing about them. It started with Meghan entering the church and walking the first part by herself. Her father wasn't able to fulfill this duty as he was recovering from heart surgery. Meghan a known feminist, decided to make the walk on her own. I would have done the same thing. It is tradition for fathers to walk their daughters down the aisle, maybe she didn't want to replace her father with anyone else. We will never know the true reason behind her decision. Once Meghan entered the second part of the church, she was joined by her soon to be father in law, Prince Charles. I though this was such a beautiful addition. To me it showed that she was accepting Harry's family as well as them accepting her. From the moment Meghan reached the alter, her and Harry held hands and shared many loving looks and sweet whispers. This broke royal tradition, it isn't common, even during a wedding to show PDA. Meghan and Harry have never had a problem holding hands and being loving towards one another. I think it was a beautiful testament to their relationship and love for one another. Throughout the service you could also see the emotion in them both. One of my favorite moments was during the sermon, Harry and Meghan were holding hands, Harry slightly turned toward his bride, beaming with love and admiration. He reached with his other hand and adjusted her ring that had turned slightly (this gave me all the feels). Meghan's Mother was seated directly across from the queen. Can we just take a moment and appreciate the magnitude of this. An African-American social worker and yoga instructor, with dreads, sitting directly across from the queen of England. We are talking about a woman, like you and me, a woman that raised a beautiful caring daughter to follow her heart and her dreams, taught her to make a difference and give back to the world. She sat across from the Monarch, a woman bound by tradition and ruled by the crown, someone who's every move is bound by duty. Please tell me I'm not the only one that took in the magnitude of this sight. A strong woman that raise a strong daughter and fought back the tears of joy while she watched her daughter become a real life princess. Most of all, she did it with grace and dignity. WOW, just WOW! Now there are so many things we could talk about, the songs played, the people that played them, the American minister and his powerful, energetic sermon and the surprise that came with it all. So much about this wedding is thrusting the Monarchy into the future. I really want to focus on the Duke and Duchess of Sussex, because its their day and their love being celebrated. Can we all agree that after the ceremony, Harry and Meghan on the steps of the church, the Royal family and Meghan's mother (who was escorted out on Prince Charles arm) standing on the steps above them. A beautiful scene with greenery and beautiful flowers. Meghan whispers to Harry, "do we kiss?" to which he responds "yes" and they share their public kiss as husband and wife.Such a beautiful moment. They even shared another during their carriage ride through The Long Walk. Well I could go on forever about the Wedding and my admiration for this forward thinking royal couple, but I will close off with a few fun and romantic facts. - Harry picked his mother favorite flowers from the royal garden for Meghan's bouquet. - Meghan's shoe soles were painted baby blue (her something blue). - Harry's gift to Meghan was his mother's aquamarine ring. - The Bentley Jaguar (sorry had Bentley on my mind cause it's my favorite car) that they took to the evening reception had their wedding date as the plate number. - True to royal protocol Meghan kept her nails short and neutral, as well as he make-up. - Meghan wore her hair in her classic simple bun, staying true to herself and her style. I just adored everything about this wedding and so glad I could see their love and passion for one another. I believe they will do great things in the future and can't wait to follow their journey in life together. I hope you enjoyed it as much as I did. These are obviously very down to earth people and I wish them both the best. Congratulations to the Duke and Duchess of Sussex. The newlyweds pose for a picture on Windsor Castle's East Terrace.